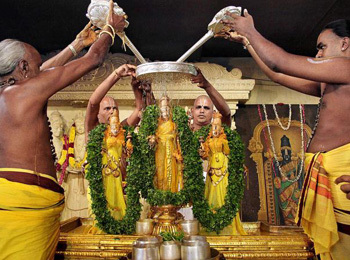 The Tirumala Tirupati Devasthanams (TTDs) celebrates Srivari Pavithrotsavam, as per the Hindu calendar, every year on the important days of Ekadasi, Dwadasi and Trayodasi in the month of Sravana. This festival is known as “Festival of Purification”. The Pavithrotsavam is also known as Sravana Pavitrotsavam. The significance of the festival is that on this day the priests symbolically seek pardon from the Lord for their acts of all omissions and commissions, committed either knowingly or unknowingly, while performing rituals throughout the year. The Utsavam is also referred by various names other names–Dosha Nivaarana, Sarva Yajna Phalapradha, Sarva Doshopasamana, Sarva Tushtikara, Sarvakaamapradha and Sarvalokasantida. This festival was first instituted by Saluva Mallaiah Deva Raja in 1463 A.D. at Tirumala, during the period of Saluva Narasimha as per the inscription no. 157, present in Srivari Temple. During these three days, Tirumanjanam and Homam are performed to the main deity and the primary idols of Lord Sri Venkateswar Swamy. As a prelude to this purification festival Ankurarpanam is performed a day before, wherein nine types of cereals are sowed in an earthen container to mark the beginning of the festival. On the first day of Pavithrotsavam, Homam (Prayer to Sacrificial Fire) is performed at the Yagyasala situated inside the temple followed by Snapana Thirumanjanam(celestial bath) for about two hours to the processional deities with sandal, turmeric, milk, curd and honey. In the evening the processional deities are taken out for a ride around the four mada streets, blessing pilgrims who converge to witness the grandeur of Lord Malayappa Swamy, draped in dazzling Gold and Diamond jewels. On the second day, after Snapana Thirumanjanam(the celestial bath) a special puja is performed to the woven silk holy threads called “Pavithralu”; they are the sanctified threads. A unique aspect of this thread is that it is made up of five colors: Black, Blue, Red, Yellow and Green. “Pavitralu” will be tied around the head, neck, waist etc. of the Lord before his statue is taken for the procession. They are also tied to various deities inside the temple, to deities of sub-temples located inside the prakaram including Ananda Nilaya Vimana Venkateswara Swamy, Yoga Narasimha Swamy etc. and also to Lord Sri Bhuvarhaswamy located adjacent to Swami Pushkarini. These holy silk threads are woven out of a special variety of high quality cotton which is grown exclusively in the land that is meant to grow Tulasi plant. On the third day, the sacred Homam is performed followed by Snapana Tirumanjanam, followed by rituals like Visesha Samarpana, a procession along four mada streets and then concludes with Purnahuthi which takes place inside the main temple.